Parts firm ETrade Supply posts several photos of what it believes to be a legitimate display from Apple's forthcoming "iPad mini" set for introduction at next Tuesday's media event. The display is said to be of the same 4:3 aspect ratio of the full-size iPad and measures 162 mm x 124 mm. Text on the back of the display suggests that the part was manufactured by LG Display, and text on the ribbon cable extending from the display is also consistent with labeling on genuine Apple parts. 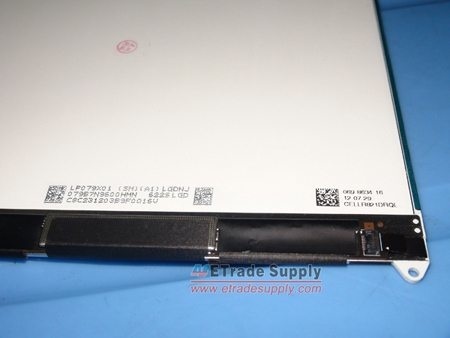 ETrade Supply has also posted several photos of an iPad mini battery, which appears to be identical to the part shared by MacRumors earlier this week with the exception of the Apple part number. 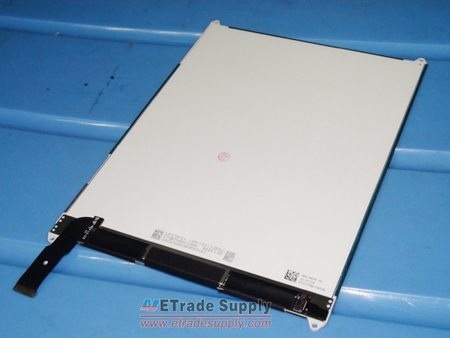 ETrade Supply's battery carries an APN of 616-0627, while the battery in our photo carried an APN of 616-0641. Any differences between the two parts are not immediately obvious. 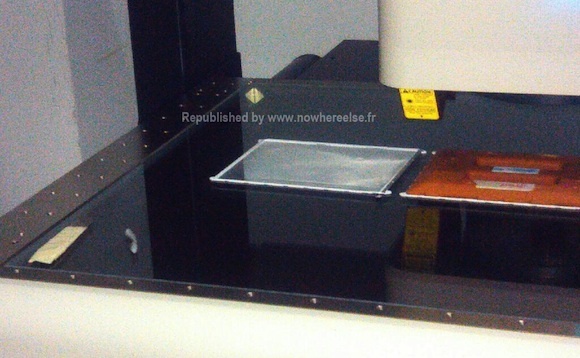 Following ETrade Supply's posting of the iPad mini display photos, French site Nowhereelse.fr posted its own photo [Google translation] of what has been claimed to be the iPad mini display in quality testing. 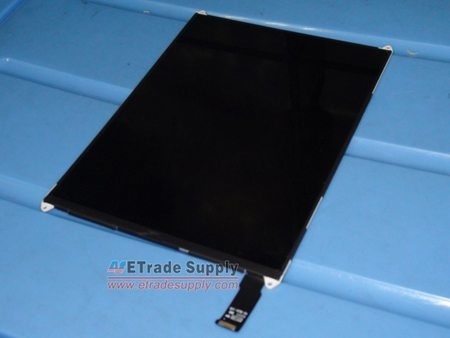 The site received the photo last week and was unable to verify with any degree of confidence that the part was indeed an iPad mini display, but with the actual part now having been shared by ETrade Supply, similarities in the mounting points for the two displays suggest that the display being tested may indeed be for the iPad mini. ...So the display isn't 16:9 ratio? That would have set it apart a little better from its bigger brother. 16:9 is only good for watching movies. When you hold the iPad vertical it is rubbish. Especially for reading books, which will be a _major_ use of the iPad mini. On the iPhone 5, there is the positive that you can still cover the width with one hand, that won't work on an iPad mini so no redeeming advantage. And there is one feature that sets it absolutely apart: Less size. No other difference is needed or wanted. Wonder what the resolution will be? 1024x768 or 2048x1536? 1024 x 768 means all software runs unchanged (just smaller). Pixel density would be higher than on the iPad 2, so you would have "almost but not quite retina" quality. 2048 x 1536 would be a waste of money. You also need more power with more pixels, and you don't have the space for a large battery on an iPad Mini. Looks like the iPad mini screen is laying on top of the iPad XXXL smart cover. Yes, in a bad way. Based on the rumors over the last few months, it looks like it will be 1024x768 to keep costs down. But, while it won't technically be retina resolution, the pixel density will still be higher than the iPad 2 simply because the same number of pixels will be fit into a smaller space. So, the sharpness will probably be somewhere between the iPad 2 and iPad 3, which is probably sufficient for most people. What KnightWRX is saying is that you cannot split the virtual pixel into smaller ones for the purpose of the touch point, well I guess you could but that'll make things messy. For this and the ease of scaling reasons, I agree with Knight and I don't think Apple will go with anything other than 2X for iPad. It'll either be 2048 x 1536 or 1024 x 768. It's just not a feasible, "easy no updates required" solution. Is it integrated with Google Maps?